GRAND RAPIDS – Tired of winter? 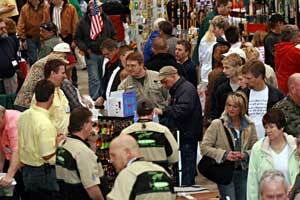 Michigan’s oldest and largest outdoor sport show ushers in spring, March 17 to 21. That’s when the Ultimate Sport Show—Grand Rapids comes to DeVos Place, 303 Monroe St. NW for its annual four-day run. Michigan's biggest show for hunters and anglers was first held in 1946. This year's 66th edition is shaping up to be the best ever for new outdoor gear, features, seminar leaders, fishing boats and specialty vendors, including many major company exhibits. "This is the Big One," said Adam Starr, event manager for ShowSpan, Inc., which produces the show. "All roads lead to Grand Rapids. Besides West Michigan, show patrons come from throughout the state as well as Illinois, Indiana, Ohio and Ontario." With so many events on the outdoor show circuit, what is it about the Ultimate Sport Show that makes attendees anxious for winter to end? "Stuff" of the Show: The 200,000 square-foot DeVos place will be loaded with more than 100 booths of fishing tackle, including one-of-a-kind vendors whose baits and lures are seen only once each year. Leading manufacturers have reserved space for their new products. Many will have company experts on hand to explain features and answer questions with no pressure to buy. The show has a reputation for educating the public as well as being a veritable supermarket of product choice and value for the show season's best buys. A dozen fishing boat dealers are bringing bass boats, walleye boats, pontoons, offshore trolling packages, river steelheading boats, canoes and kayaks. More than 100 outfitters, lodges, fishing and hunting guides, and family vacation destinations are in the show, along with many other exhibitors. Seminars: More than 100 free hunting and fishing seminars will be held on four stages, including Lake Ultimate, the 110,000-gallon indoor lake with fully rigged boats from which fishing experts deliver real-time seminars. Fee-based weekend Super Clinics for walleye and trout/salmon are part of the lineup. Mark Martin, Denny Geurink and Mark Romanack are among many Michigan experts with national reputations. The father-son team of Fred and Greg Abbas, whitetail and turkey experts respectively, will be on hand to impart their specialized knowledge. Local fishing guides will demonstrate their successful tactics on Lake Ultimate and other stages. Calling Competitions: The Grand Valley Chapter of the National Wild Turkey Federation will host its annual Turkey Hunting Workshop from 10:00 a.m. to Noon on Saturday. The workshop and the 16th Annual Grand Rapids Open Turkey Calling Competition, that evening from 6:00 to 8:00 p.m., are both free with admission. Also on Saturday, the public is invited to compete and attend the 4th Annual Great Lakes Duck & Goose Calling Competition, presented by Ducks Unlimited. Amateur Division competition begins at 1:00 p.m., followed by Open Division competition about 3:00 p.m. Registration and more details are at www.callingducks.com. Grand Rapids Ultimate Sport Show is a great fishing and outdoors show. We have a booth in the show again this year for our train in fishing lodge in Northern Ontario Canada, Erringtons’ Wilderness Island. We look forward to it again. Great crowd, great exhibits and great location in downtown Grand Rapids.